The Lockheed T-33 Shooting Star is an American-built jet trainer aircraft. It was produced by Lockheed and made its first flight in 1948, piloted by Tony LeVier. The T-33 was developed from the Lockheed P-80/F-80 starting as TP-80C/TF-80C in development, then designated T-33A. It was used by the U.S. Navy initially as TO-2 then TV-2, and after 1962, T-33B. While there are no more military T-33s still in active service, the type is very popular with the jet warbird crowd. Many T-33s spent over 40 years on active service before being retired. The aircraft was license built in large numbers by Canadair and Kawasaki. The T-33 has been seeing some popularity in the last few years. Prior to this resurgence, the only T-33s kitted in 1/72 were by Hasegawa (one of their first generation kits) and Heller. Both were from the 60s and 70s. A few years back, Sword released their T-33 as part of their Shooting Star series, all of which are short run kits and all of which sold very well. This is the third boxing from Platz of this very nicely done kits. I'm still waiting for some additional Shooting Star versions as the tooling looks very much as if it is designed for that. 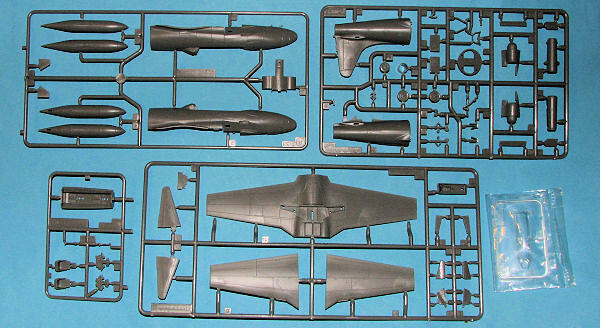 Of the four main sprues, two are specific to the T-33. Typical of Platz kits, the molding is top notch. The cockpit is very well done with raised detail on the instrument panels and decals to put over them if one so wishes. The seats appear to be the proper version. This is all covered by a one-piece canopy that includes the canopy actuating mechanism. Since this is to be part of a series of kits, it is not surprising that the fuselage is modular. It is split about where the real aircraft is divided to gain access to the engine. There is, of course, no engine in this boxing, but there is a lot of detail on the inside of the fuselage that hints at something like this in the future. There are blanking plates for the engine intakes and a nice, long tailpipe for the exhaust. Landing gear are well molded with all the appropriate struts. You also get separate speed brakes that can be molded open. As these usually bled down after the engine was shut off, it is an appropriate option. No indication of nose weight is give in the instructions, but wise modelers will add some just to be sure. From the look of things, this kit is not designed to be built gear up. Tip tanks are in three pieces with two tank halves and a separate stabilizing fin. This can be useful for some schemes where the fin is a different color from the rest of the tank. Instructions are very nicely illustrated and provide Gunze paint references as well as FS 595 when appropriate. The instructions are mostly in Japanese so any advice given during the build will be illegible to many. 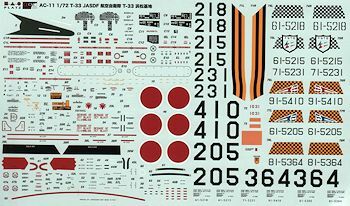 The sheet provides markings for six different aircraft based at Hamamatsu AB. This is pretty much a training base so most are with training squadrons based there. All are in overall unpainted metal (or perhaps silver lacquer). All but one have the base checkered fin stripe and two have a yellow tail section as shown on the box art plane. This aircraft is the only one with a fuselage stripe. Unlike most T-33s, the outer wing tank color is yellow. Markings are for aircraft from the 1st, 33rd and 35th Training Squadrons. The decals are superbly printed by Cartograf and Platz offers a most complete stencil guide. Those wanting a T-33 kit will want to add one of these to your collection. I built one not too long ago and it proved to be a very nice kit that offers more detail than those previously released. If you don't like the kit markings options, there are aftermarket sheets available for this one.